Carriger estate originated with a land purchase from General Vallejo. Encompassing 1,000 acres at the time Nicholas Carriger purchased it in the 1840s from General Mariano Vallejo, the property now consists of only 16 acres – but each one of them is a treasure in its own right. 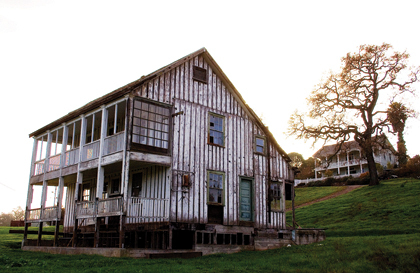 The original home and two other structures are listed on the Registry of National Historic Places and the entire estate is classified as a Sonoma County Landmark. Nicholas Carriger, a Tennessee native, headed west in the spring of 1846 in the company of two other parties, including the Donner Party. When the group reached Salt Lake City, the Donner Party decided to stay over for a time, against the urgings of Carriger, who warned that the weather could be too bad if they waited. We know what that delay cost members of the Donner Party, but Carriger also lost family members in the Sierra Nevada. When Carriger reached Sonoma, he mustered General Vallejo and others to form a search party to try to rescue the Donners. After striking gold near Auburn, in 1847 Carriger paid Vallejo $4,000 in gold dust (apparently the first such dust seen in Sonoma Valley) for 1,000 acres in the foothills of the Sonoma Mountains in El Verano. Vallejo was so pleased to be paid for his land – some settlers didn’t bother paying for land, they just took it, thank-you-very-much – that he presented Carriger with a fountain. Incorporating leaping carp and female figures, it was topped with a wide-mouthed swan, its wings extended and its neck arched upward. Now preserved, the fountain is in a pond set into the slope in front of the main house; a similar one can be seen at Lachryma Montis, the Vallejo home in Sonoma that is now state park property. Carriger also received grapevine cuttings from Vallejo’s brother, Leese, which he used in 1847 to plant a small vineyard, which is believed to be the first one established in Sonoma Valley by an American settler. When that vineyard was destroyed by grazing cattle, Carriger planted another one on his property; within a few years, he had nearly 150 acres in grapes. In 1875, he built a 10,000-square-foot, three-story winery and distillery building where, according to county historical records, he produced both wine and brandy. Eventually, he produced some 28,000 gallons of wine. Phylloxera would essentially eradicate the vineyards, but not until after Carriger’s death in 1885, according to a report prepared by JRP Historical Consulting Services. The residence which is framed in redwood and set on a stone foundation, retains its original flooring and ceilings. Photo by Ryan Lely. Carriger constructed the main house somewhere between 1847 and 1850. 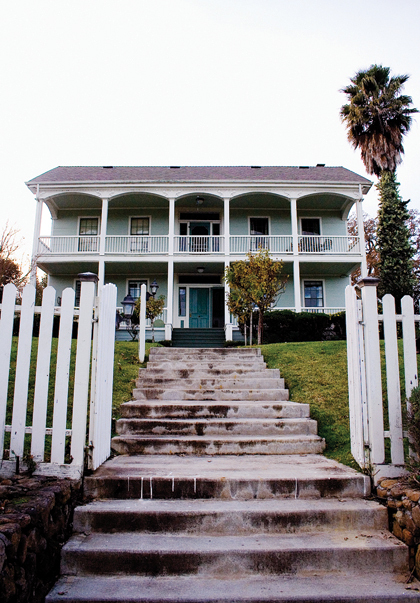 Sited at the top of a knoll, it is a charming white structure built in the vernacular Greek Revival style. Its most wonderful features are the verandas, which offer stupendous views of the southwestern part of Sonoma Valley and the Mayacamas mountains to the east. The residence, which is framed in redwood and set on a stone foundation, retains its original flooring and ceilings, although alterations and upgrades have been performed over the decades. Originally two rooms up and down, the home has been expanded to four bedrooms and four baths, plus a terrace room on the west side. Slightly to the north is a freestanding root cellar built of stone and snuggled into the hill. Previous owners, including Geoffrey and Donna Barton, had restored various buildings by the time Woods bought the Nicholas Carriger Farm, as it is known. Woods is thinking about renovating “the little Carriger house,” which was relocated to the property in 2000 after an absence of several decades. In addition to the residential structures and the winery – which is permitted to produce 5,000 cases but not to operate a tasting room – the estate’s grounds feature a 10-stall horse barn, an outdoor riding arena and 8 acres suitable for a vineyard (or almost anything else), along with a well, a pump house and a 55,000-gallon reservoir tank built into the hillside. A delightful aspect of the farm is a hidden spring that delivers fresh water to a small, concrete-lined reservoir inside a little shack that is itself sheltered by berry brambles and the draping branches of an ancient fig tree. Woods said that Carriger granted lifetime rights to the fresh water to an old Native American – who lived to the age of 114. 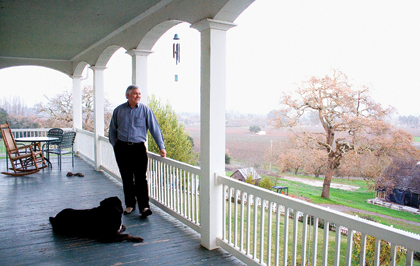 Michael Woods overlooks the grounds of the Carriger Estate from the veranda. Photo by Ryan Lely. While much has changed in the Sonoma Valley since Carriger’s day, many of the views from his old house remain remarkably the same. At night, owls still swirl and screech on their hunting rounds and often coyotes can be heard in the near distance, too. Sonoma Valley is home to a bevy of old estates and mansions, many of them hidden from view by other structures, hills, trees or simply distance from nearby roads. This is the first in a series on these historic properties, in which we will take Sun readers beyond the gates and, in some cases, into the residences themselves.